Mallo accidentally startled all the Carrier Birds and they have escaped into Crashmo Park. In order to get them back, he will have to climb to the top of Grandpa's challenging Crashmo puzzles. Each puzzle is a structure made out of colored blocks. Mallo can push and pull each of the segments of color, causing the structure to fall down. He must move all the pieces so that a staircase to the top is formed. You can also make your own puzzles and export them as QR codes. 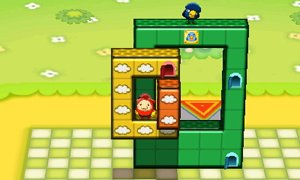 Other players can scan these codes to play the puzzles themselves.